Although its boundaries come within 100 metres of the sea, Courtown is actually a parkland course. It is surrounded on three sides by forestry and the course boasts hundreds of mature trees. In fact every fairway is lined to reward the accurate golfer and punish the wayward. The course is a matured par 71 almost 6000 metres in length and provides great variety. The four par 3s are a feature, particularly the 18th where a water hazard and the threatening out of bounds on the left have to be negotiated. For the big hitters there are three par 5s, including the new dog-leg 9th hole, an imposing end to the front nine. 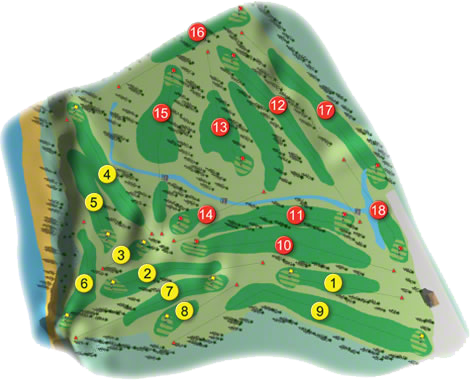 The remaining par 4s include the 4th, the signature hole, revered nationally and internationally. 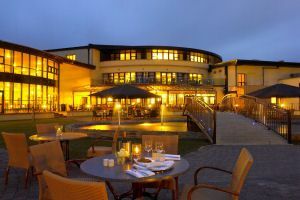 With its panoramic views of the south Irish Sea and the beautiful North Wexford coast it provides a delightful distraction to many a bad round. There are excellent bar and catering facilities. Snacks are available all year round and full catering facilities are available except during the winter months when they are only available to groups on request. Over 100 people can be seated for dinner. The specious bar overlooks the course. A warm welcome is extended to visitors at this fine parkland course. The Ladies of Courtown Golf Club won the Mid Leinster Final of the Junior Foursomes when they beat near neighbours Wicklow Golf Club by 2-matches to 1-match at Tullamore Golf Club on Saturday 1st September 2018. They were led out by Catherine Quinn (17) with Mary Osborne (20) who went up the 20th before securing the point against Una Doyle (16) with Nora Dunne (19) in the middle match Stella Courtney (16) with Mary Kilbride (23) they lost their match against Bernie O'Donoghue (18) with Mary Stapleton (18) by 4 and 3 and the bottom match of Mairead Sunderland (20) with Julie McCartan (22) against Trish Shannon (15) with Anne Hollingsworth (24) was also a close run match when the ladies from South Wicklow won out by the minimum of 1-hole. They made their way to Knightsbrook Hotel & Golf Resort to participate in the All-Ireland Deciders where they met Connacht Champions Ballina Golf Club in the All-Ireland Semi-Final on Thursday 27th September and beat them by 2-matches to 1-match against the ladies from the West. They were led out again by Catherine Quinn with Mary Osborne who lost their match against Shauna Smith with Claire Cooke by 4 and 3, they were followed by Stella Courtney with Mary Kilbride who recorded a 4 and 2 win over Bertha Cooke with Dolores Tuohy and again the bottom match Mairead Sunderland with Eileen Cullen was another nail baiting match against Pauline Gilger-Tuohy with Mary Reynolds when it went up the 19th before securing the point and their place in the All-Ireland Final the following day. On the Saturday they met Ulster Champions Shandon Park Golf Club in the All-Ireland Final and had a comfortable 2½-matches to ½-match. They were led out once more by Catherine Quinn with Mary Osborne who had a resounding 6 and 4 win over Debra Thompson with Gillian Harran, in the middle match Stella Courtney with Mary Kilbride recorded a comfortable 4 and 3 win over Deborah Sweeney with Loraine McCaffrey and the bottom match of Mairead Sunderland with Eileen Cullen against Mary Thompson with Brenda Marson was declared as a halve when called-in. Courtown Golf Club won the Leinster Final of the Pierce Purcell Shield in 2009 and was drawn against Munster Champions Douglas Golf Club in the All-Ireland Semi-Final at Tullamore Golf Club in September. They were led by John Dowling with Tony Merrigan who got off to the perfect start when beating Richard Lonergan with Kevin O'Sullivan by 5 and 3. They were followed by Nicky Hubbard with Jim Lowe who lost out to Michael Lucey with John Scannell by 5and 4. Next up was Jarlath Beagan with Gary Began who lost out to Eddie Cogan with Frank Walsh by the slenderest of margins the 1-hole. Things were not looking too good for the Wexford men at this stage until Gerry Finnerty with Fran Lawlor delivered a 3 and 1 win over Tony Barry with Paul Herlihy in the penultimate match. So it was down to the bottom match of Ciaran Conneely with Paul O'Kane against Frank Mackey with Philip O'Driscoll to decide who went into the All-Ireland Final, the Courtown pair delivered the necessary point with a 4 and 2 victory. They Met Ulster Champions Letterkenny in the decider, John Dowling with Tony Merrigan led again against Pat McMonagle & Kieran Sweeney but this time the result was reversed with a 2 and 1 win for the men from Donegal. Next up was John Rafferty with Joe O'Dwyer who had a 3 and 2 win over Brian O'Donnell with Tony McMonagle. The 3rd match Jarlath Beagan with Gary Beagan became the decider as to where the coveted green pennant would go when it went all the way to the 22nd hole before John Russell with Kieran Walsh delivered the crucial point for Letterkenny. The penultimate match of Gerry Finnerty with Fran Lawlor against Ed Margey with Brendan Roache went to the Donegal pair and with it the pennant. The bottom match of Ciaran Conneely with Paul O'Kane against Kenny King with Shane Sweeney went down to the 20th-hole before the point was clinched by Courtown, alas too late. Well done Courtown as this was your first Leinster pennant in the Cups & Shields, a bit more coaching by John Coone might see them deliver the green soon! The Ladies of Courtown Golf Club won the Finn Trophy in 2009, when the team was Denise Kavanagh, Ann Bernie, Marina Coone, Pat Kinsella, Sorcha Howell, Barbara Long, Eileen Allen, Kate Sheehan, Pat Walters, Marion Siggins and Irene Poole. 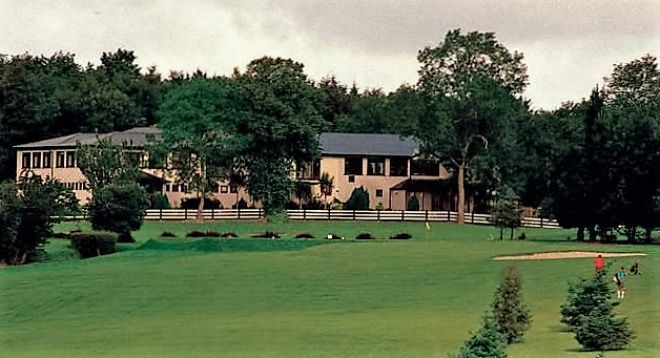 The Ladies of Courtown Golf Club won the East-Leinster Final of the AA Insurance Junior Foursomes and made their way to Royal Tara Golf Club to participate in the National deciders in 2009. They lost to Ulster Champions and eventual winners Edenmore Golf Club in the All-Ireland Semi-Final by 3 matches to nil. First on the tee was Pat Kinsella (18) with Irene Poole (19) who lost their match by 6 and 5 to Zoe Allen (18) with Claire Ussher (23), they were followed by Mary Osborne (16) with Mairead Sunderland (23) who lost by 2 and 1 against Debbie McMaster (15) with Heather Fleming (30), the bottom match of Kate Sheehan (20) with Mary Kilbride (23) against Sally Cushnahan (28) with Cherry Logan (19) also went to the Ulster club by 5 and 3. The Ladies of Courtown Golf Club won the East-Leinster Final of the AA-Insurance Intermediate Cup in 2008 they made the journey to Limerick Golf Club to compete in the National deciders; where they met Munster Champions East Cork Golf Club in the All-Ireland Semi-Final and lost out by 4 matches to 1 match. First on the tee was Pat Kinsella (16) who lost her match by 5 and 3 against Marie O'Brien (16), she was followed by Anne Targett (17) who halved her match against Deirdre Harte (16), next up was Irene Poole (19) who lost her match by 4 and 3 to Theresa Roche (17), the penultimate match of Kate Sheehan (20) against Valerie McCarthy (17) was halved, in the bottom match Siobhan Freeney (20) had a 7 and 5 defeat against Breda O'Farrell (20). 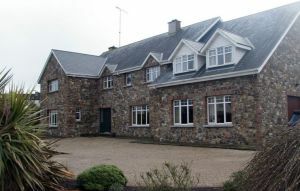 Courtown Golf Club won the Cullen Cup in 2008, when the team was Pat Kinsella, Dorothy Kenny, Paddy O'Dowd, Denise Kavanagh, Cyril Williamson, Eileen Cullen, Tony Kinsella, Siobhan Freeney, Brendan Sheehan, Anne Targett, Ollie Quigley, Mary Osborne, Julie McCartan, Mick Morrissey and Colin Sunderland. The Ladies' of Courtown Golf Club won the inaugural East-Leinster Championship in the AA-Insurance ILGU inter-club Junior Cup in 2006; they made their way to Headfort Golf Club to compete in the National decider, where they met Connaught Champions Galway Golf Club in the All-Ireland Semi-Final and lost out by 3-matches to 2-matchs. They were led by Denise Kavanagh (9) who won her match by 1-hole against Geraldine Neville (9), she was followed by Eileen Allen (11) who lost her match by 5 and 4 against Sheelagh Kearney (9), next up was Pat Walters (12) who won her match by 2-holes against Bryde Glynn (10), the penultimate match of Mary O'Reilly (13) went all the way to the 22nd-hole before she conceded the point to Rita Grealish (12), in the bottom match Ann Bernie (13) lost by 5 and 4 against Pat Lillis (12). The Ladies' of Courtown Golf Club won the inaugural East-Leinster Championship in the AA-Insurance ILGU inter-club Minor Cup in 2006; they made their way to Headfort Golf Club to compete in the National decider, where they met Connaught Champions Galway Bay Golf Club and eventual green pennant winners in the All-Ireland Semi-Final and lost out by 4-matches to 1-match. They were led by Siobhan Freeney (23) who lost her match by 6 and 4 against Aoife Killeen (23), she was followed by Biddy Butler (23) who also lost her match by 5 and 3 against Fiona O'Driscoll (25), the following two matches of Patsy Gaffney (24) against Helena Walters (27) and Denise Burke (24) against Patricia Melville (28) were halved, in the bottom match Patty Flynn (25) lost her match by 4 and 3 against Eilish Molloy (29). Courtown Golf Club won the Inaugural All-IrelandJ. B. Carr Diamond Trophy at Woodenbridge Golf Club in 1996. The team was Eamonn Cullen, Jimmy McGill, John Bolger, Jim Millar, Jim Sheehan, Tom Reynolds, Jack Whelan, Stephen Redmond, Michael Sheehan, Reg Checkett and Paschal Storan, they were managed by Pat Doyle. They were County Champions in the J. B. Carr Diamond Trophy in 2002.